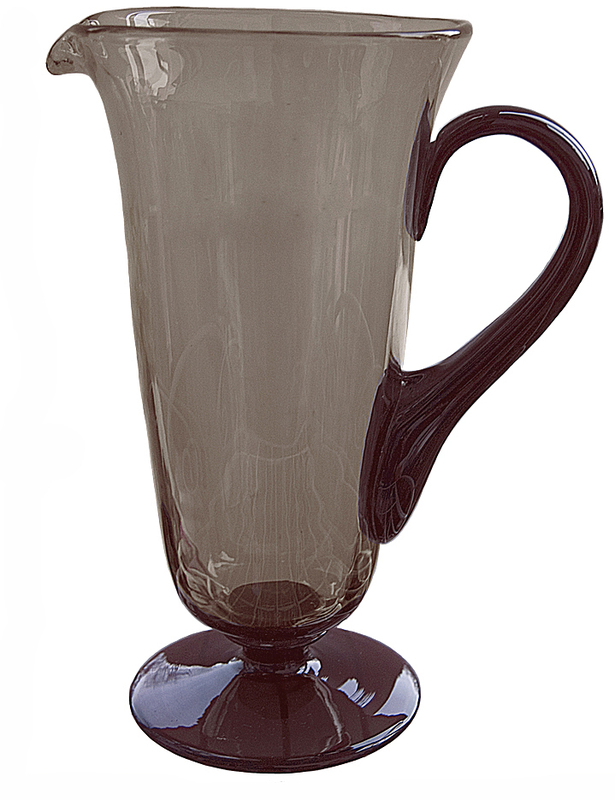 Condition: Our stunning pitcher and tumbler set is in Undamaged Condition without chips, cracks, or mold damage. The color is beautiful. The color pretty much matches the color in the photo when the set is under light. When it is viewed without really bright light the body looks a bit more yellow and the handles and feet look dark amethyst (black). We tried to verify the colors in the Morgantown book. We think this is smoke but there is a possibility that the color is Topaz Mist with an Amethyst handle and feet. Pitcher Measurement: 10 3/4" H. - 8" W.
Tumbler Measurement: 5 3/4" H. - 3 5/8" D.